You are currently browsing the tag archive for the ‘depaving’ tag. I was stunned when I first saw the size of this verge garden in Greenbank Street. You can see the original verge garden on the far left. What a difference a verge garden makes. 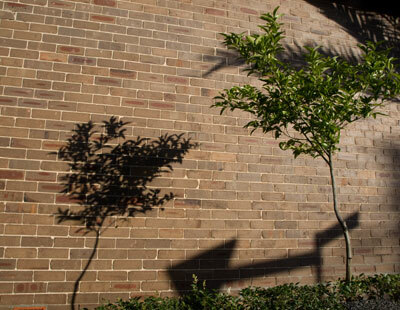 It softens the streetscape & adds beauty. 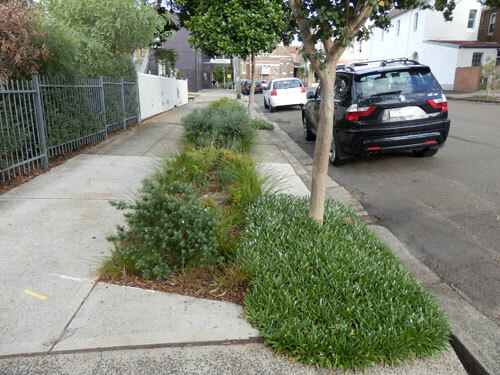 I was taken to see another verge garden in Greenbank Street Marrickville recently. It appears to have been organized by two houses, but it may be that the one house organized it & the other house didn’t mind their neighbour making improvements in front of their place. Whatever the details, this verge is really special & shows just what can be done. 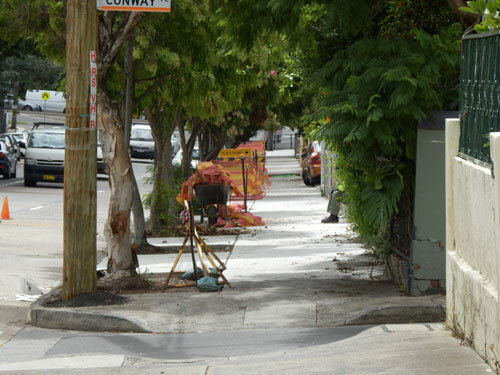 They have obviously paid for Marrickville Council to remove the concrete. 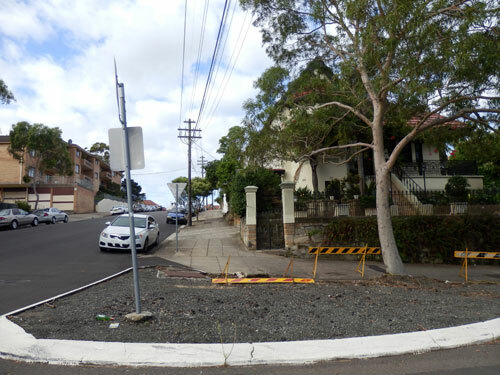 Three verge gardens have been created – two of around 5-metres each long & another of around 2.5-metres & they span two adjoining properties. 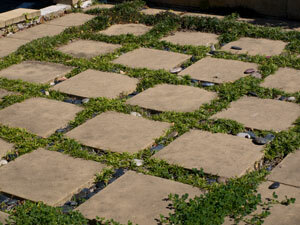 Concrete has been left roadside for car doors & there is a path between each garden for pedestrians. 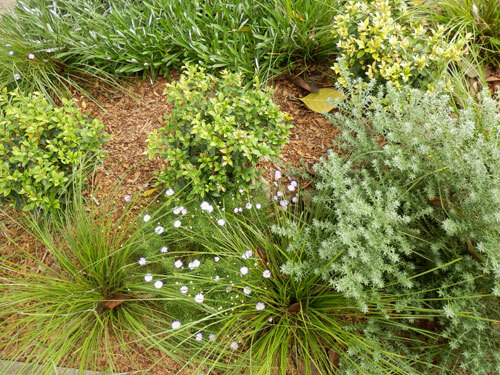 The garden beds have been planted with a mix of natives & ornamentals & covered with mulch. Except for the occasional weeding, it looks like that these verge gardens will pretty much look after themselves. Around the corner in a nameless lane (at least on Google maps), the residents have planted a row of Lilly Pillies in the small space between the house & the kerb & covered the visible soil with mulch. 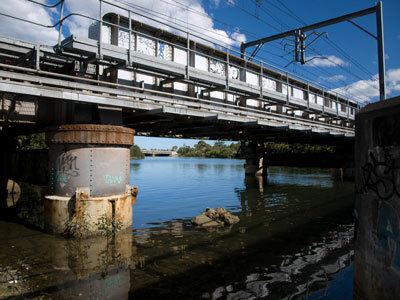 These places traditionally look not so good as they collect weeds & litter, but these residents have demonstrated that such a difficult place can look very attractive. 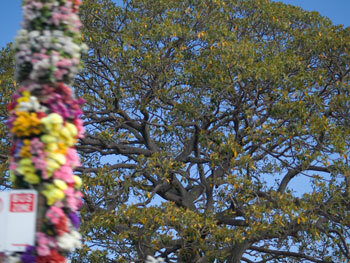 Lilly Pillies can be pruned to form a hedge & I expect this is what is planned. 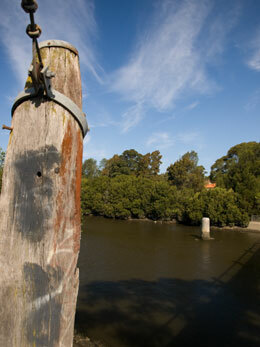 The Lilly Pillies have the added benefit of preventing graffiti tags on what is a vulnerable wall because of its location. 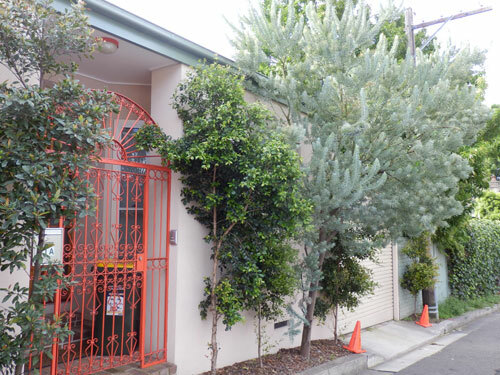 Lilly Pillies adding greenery in a difficult space in the laneway. This looks great now & will look even better once they have grown. Further down the land is the entrance to another property, which is bordered by small native trees & the back fence is covered with a vine. 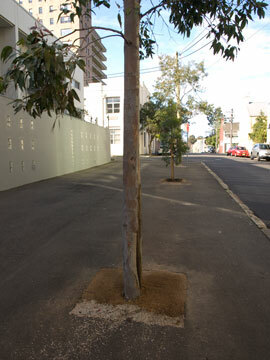 The residents on one side of Greenbank Street have planted around almost every street tree & it looks nice. It’s when you come to the larger verge gardens & the lane way that you see the potential many of us have to radically improve our streetscape. 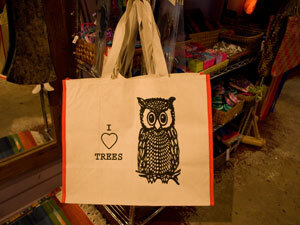 It doesn’t have to be prohibitively expensive either. 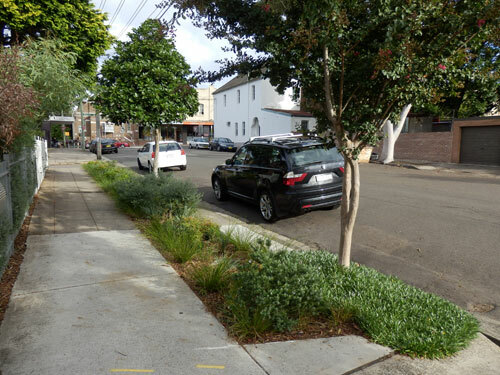 If you can encourage a good number of residents in a street to embrace verge gardens & become a Sustainable Street, you can apply to Council to come & depave for you as happened in Lincoln Street recently. 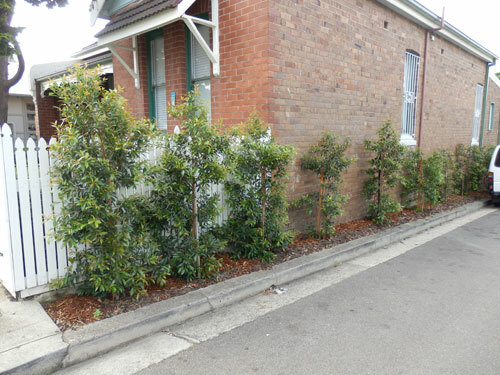 See – http://bit.ly/YpZmrH Council might even throw in some plants. 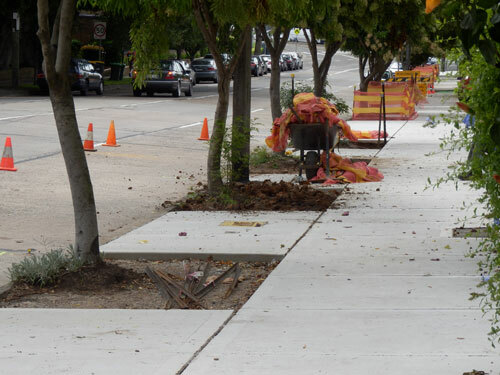 If it’s just you, then there is a cost involved for Council to depave, but they do all the work like check for hidden infrastructure & take away the concrete, which saves you effort & skip fees. If you find yourself near Greenbank Street, I think it’s worthwhile to stop & have a look at these verge gardens as well as a look in the laneway. I say this because good gardens & less hard surfaces changes the way an area feels & it is good to feel this whenever you can. 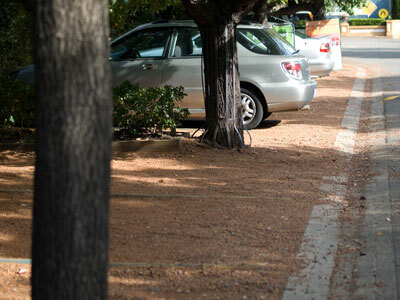 You may not like some of the plants, but that’s the beauty of a verge garden – as long as it doesn’t become as hazard to cars or pedestrians, you can plant what you like. I think they have done something wonderful & inspiring. This view shows the concrete strip beside the kerb. Imagine streets that looked green like this, instead of harsh concrete expanses. The laneway is transformed on this side & clearly shows how even such difficult sites can be made beautiful, as well as useful for wildlife. 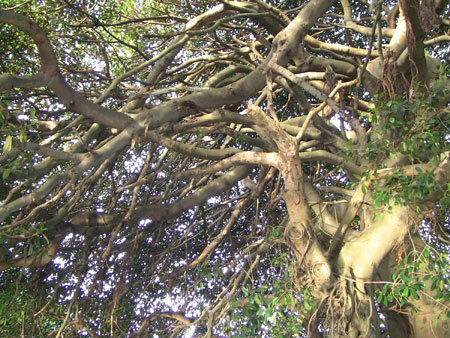 This tree really wanted to live, which is a good thing because it is very beautiful. 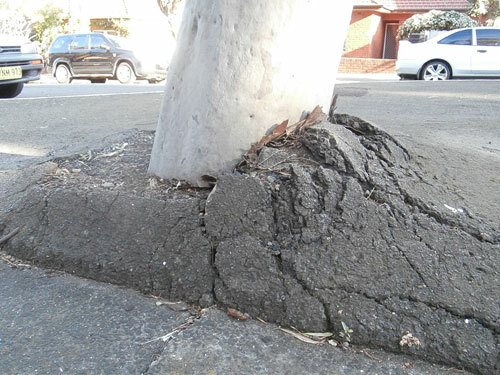 In August 2012 I came across a traffic island in Arthur Street Marrickville where I found a street tree living in what I thought were appalling conditions. A large traffic island had been covered with bitumen & much of this had formed a collar up one side of the tree’s trunk as it had grown. I thought at the time what a wasted opportunity for a verge garden & wondered at the miracle of the tree’s survival as it was very healthy. 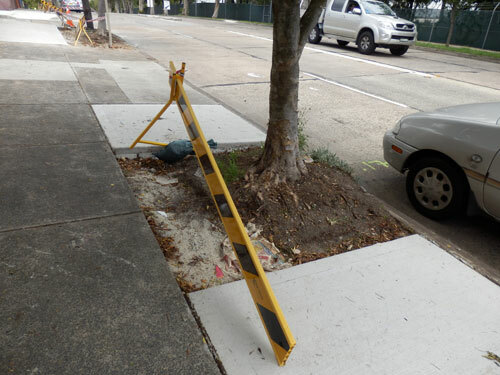 Last Sunday I cycled past this tree & to my delight saw that Marrickville Council has started to depave this traffic island. They have already removed the bitumen & there is only the layer of gravel to go. 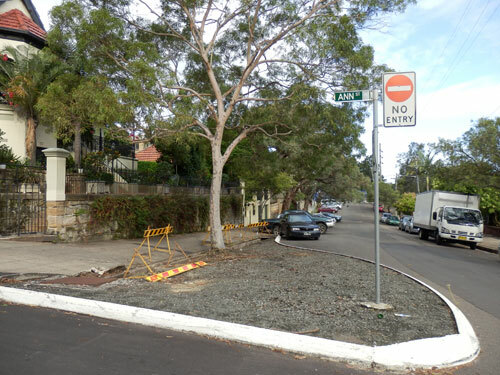 I am pretty sure they will be creating a verge garden here as they would have only removed some of the bitumen around the tree if they didn’t plan for anything more. Because of the shape of the traffic island & that it is on the corner of Arthur & Ann Streets, it will be visible from quite a distance & therefore benefit the streetscape of two streets. 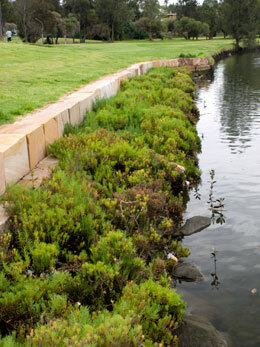 Of course there are the benefits of less heat & more green, plus help with stormwater if this island is made into a verge garden. 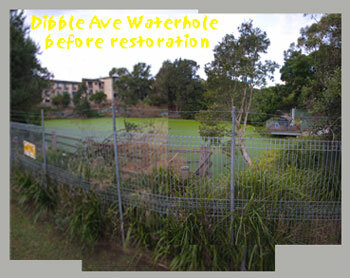 I will keep a check on the progress & post again when the work has been completed. After depaving. 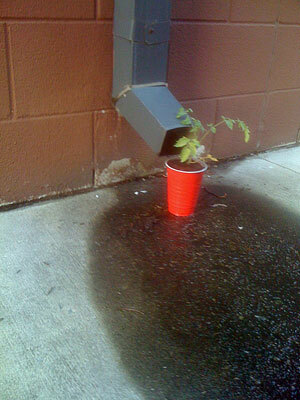 The tree would have enjoyed all this recent rain. 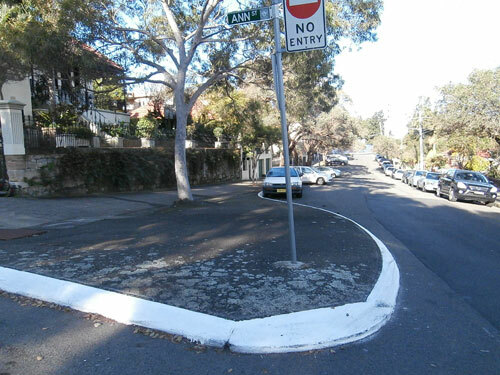 You can see how visible this traffic island is to the section of Arthur Street to Illawarra Road. The traffic island is also visible to Ann Street. A verge garden here will improve the streetscape.